The Blessed Sacrament, also Most Blessed Sacrament, is a devotional name used in the Latin Church of the Catholic Church, as well as in Anglicanism, Lutheranism, Methodism, and the Old Catholic Church, as well as in some of the Eastern Catholic Churches, to refer to the body and blood of Christ in the form of consecrated sacramental bread and wine at a celebration of the Eucharist. In the Byzantine Rite, the terms Holy Gifts and Divine Mysteries are used to refer to the consecrated elements. Christians in these traditions believe in the Real Presence of Jesus Christ in the Eucharistic elements of the bread and wine and some of them, therefore, practice Eucharistic reservation and adoration. This belief is based on interpretations of both scripture and sacred tradition. The Catholic understanding has been defined by numerous ecumenical councils, including the Fourth Lateran Council and the Council of Trent, which is quoted in the Catechism of the Catholic Church (which explains the meaning of transubstantiation). The largest Portuguese feast in the world is held in New Bedford, Massachusetts in honor of the Blessed Sacrament attracting over 100,000 visitors each year. The Blessed Sacrament may be received by Catholics who have undergone First Holy Communion as part of the Liturgy of the Eucharist during Mass. Catholics believe that the soul of the person receiving the Eucharist must be in a "state of grace" (i.e., not be in a state of mortal sin) at the time of reception; to receive the Eucharist in a state of mortal sin is to commit sacrilege. Reception of the Blessed Sacrament in the Anglican Communion and other Anglican jurisdictions varies by province. Formerly, Confirmation was generally required as a precondition to reception, but many provinces now allow all the baptised to partake as long as they are in good standing with the Church and have previously received First Communion. Devotions to the Blessed Sacrament vary. Individuals will genuflect or bow in the presence of the Blessed Sacrament, which may be reserved in a tabernacle or aumbry on, behind, or near the altar. Its presence is usually indicated by a lamp suspended over or placed near the tabernacle or aumbry. 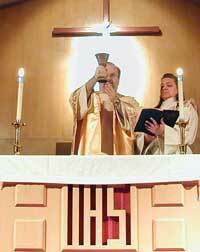 Except among Anglo-Catholics, the use of a monstrance is rare. This is in keeping with the Article XXV of the Thirty-Nine Articles that "the Sacraments were not ordained of Christ to be gazed upon, or to be carried about, but that we should duly use Them." Nonetheless, many parishes do have services of devotions to the Blessed Sacrament, in which a ciborium is removed from the tabernacle or aumbry and hymns, prayers, psalms, and sentences of devotion are sung or read. 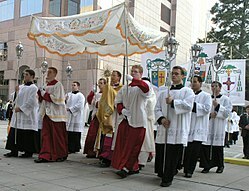 In some parishes, when the Blessed Sacrament is moved from the tabernacle (from a high altar to a chapel altar, for instance), sanctus bells are rung and all who are present kneel. In most Lutheran churches, a person must have had catechetical training prior to a First Communion (or have received Confirmation in the Lutheran Church) to receive the Eucharist. Recently, more liberal churches allow all who are baptized to receive it. Similar to the Anglican teaching, Lutherans are also taught to genuflect or bow in the presence of the Blessed Sacrament, which is normally located on an altar. In the Lutheran churches that still celebrate the Feast of Corpus Christi, like the Catholic Church, a monstrance is used to display the Blessed Sacrament during the Benediction. The Doctrines and Discipline of the Methodist Church specifies, on days during which Holy Communion is celebrated, that "Upon entering the church let the communicants bow in prayer and in the spirit of prayer and meditation approach the Blessed Sacrament." Methodists practice an Open Table, in which all baptised Christians are invited to receive Holy Communion. ^ The Doctrines and Discipline of the Methodist Church. Nashville, Tennessee: The Methodist Publishing House. 1960. p. 522. Upon entering the church let the communicants bow in prayer and in the spirit of prayer and meditation approach the Blessed Sacrament. ^ Akselberg, Kristian. "Come and See – Some (disorganised) thoughts". Greek Orthodox Archdiocese of Thyateira and Great Britain. ^ "Feast History". portuguesefeast.com. Retrieved 2017-06-13. ^ The Doctrines and Discipline of the Methodist Church. Nashville, Tennessee: The Methodist Publishing House. 1960. p. 522. ^ a b Abraham, William J.; Watson, David F. (2013). Key United Methodist Beliefs. Abingdon Press. pp. 103–104. ISBN 9781426756610. Charles Wesley wrote a marvelous collection of hymns that offer an amazing vision of Christ's mysterious, yet real, presence in the bread and the wine. Here is a stanza from one of them: We need not now go up to Heaven, To bring the long sought Saviour down; Thou art to all already given, Thou dost e’en now Thy banquet crown: To every faithful soul appear, And show Thy real presence here! ^ Smith, R.; Ackah, W.; Reddie, A. (18 June 2014). Churches, Blackness, and Contested Multiculturalism: Europe, Africa, and North America. Palgrave Macmillan US. p. 162. ISBN 9781137386380. "Code of Canon Law [CIC]". Libreria Editrice Vaticana. 1983.